…Or Are You Stuck Between Floors? Are your key relationships moving you up?… Or holding you back? Professional C- Suite coaching can be tailored to meet your desired outcomes. Increase productivity, profit and personal effectiveness. Goal setting, feedback, feed forward and reflection. Get the wins and the rewards while enjoying the game. Since 1995, successful executives, consultants and coaches have chosen Hayward for their professional coaching support. If you want to dramatically improve your performance, earnings and outcomes you have chosen the right coach. How many times have you seen a business partner or colleague enter a room with a great chance to network with highly influential people, who can positively impact their business or career, then fall flat on their face? They are socially awkward, can’t find the right words or worse yet, can’t find any words. They know their business inside and out, but at the moment of integrity they simply fail to deliver. Maybe it was fear, anxiety or just a lack of preparedness. The bottom line is they lose because their soft skill competency fails to match their business skill competency. Hayward provides coaching and training to executives and entrepreneurs to ensure their soft skill capacity is equal to their business skill capacity. Is Hayward the right coach for you? If you are an executive, a business owner or contemplating a move in that direction, a leader of a non-profit or government entity, accomplished or novice public speaker, a coach, trainer or a consultant, you represent the type of client Hayward has worked with effectively in the past. If you want to build a better team, increase your bottom line, redefine your top line goals, learn to play better with others, or even build a better you, your desired outcomes match the types of results we can help you achieve. 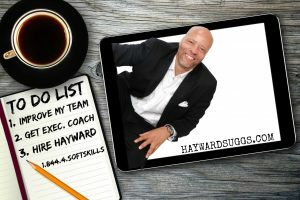 Hayward is very straight forward, if you really want to win, if you are willing to work for your success and enjoy mixing in some fun, his approach to coaching and consulting would be a match for you. You can choose to meet with Hayward face to face, by phone or through his virtual office. He will travel if needed and is available for on call and emergency coaching sessions. Confidential, supportive and resourceful. You can reach Hayward at 1-815-828-6500. We also offer on call and emergency support.